Touchscreen display PCs have paved the way for a new approach to human-machine interaction. Many devices are being integrated with this technology for commercial and industrial applications because of its intuitiveness. In fact, industrial PCs with a touchscreen technology offer several advantages such as faster operability, ease of usage, more straightforward interface and reduced costs. Moreover, physical limitations are no longer a barrier to operate devices for as long as it has a touchscreen option. Thus, touchscreen PCs can offer high resistance to scratches, better screen quality, making visual quality clearer and readable even under tough ambient situations. However, issues can occur over time due to several circumstances such as frequent usage, dirt and poor calibration. So, what happens when a touchscreen PC fails to function? Can it be fixed or should we call for technical support? This blog can help you with common issues encountered on touchscreen displays and learn the right troubleshooting tips to take care of such devices. Most industries are now utilising devices with touchscreen technology. Amongst the most common equipment used are the touchscreen displays and monitors. Moreover, while it is true that touchscreens are built with durability, some instances cannot be prevented. Touch technologies are not exempted from damages due to excessive moisture intrusion and harsh temperatures. In industrial applications, exposure to extreme shock or vibration can also harm the device. For everyday situation, mishandling and possibilities of dirt intrusion can make the device unresponsive. So, one way to fix a touchscreen display is to identify the problem correctly. By understanding the cause, looking for the right solution is easy. Usually, users touch an icon-displayed application on the screen monitors. However, a display may lose calibration occasionally which results in unresponsiveness or incorrect function response. Uncalibrated displays require re-calibration which is already provided through the device’s settings program. Since touchscreens are being used in commercial, industrial, military and manufacturing sectors, screens are exposed to damaging elements. Without a doubt, a display’s screen is exposed to scratches and other conditions that can cause impact damages. Unfortunately, this issue does not offer a quick fix. That is the reason why screen damages can be prevented by protecting the screen and keeping it in a safe place. Other than frequent contact, accumulated dirt can also cause damage to touchscreens. This can also cause a device to become unresponsive. If left unresolved, it can cause long-term issues and may not be able to be used. To prevent costly problems, frequent cleaning of the screen with a lint-free cloth is advisable. Although touchscreen displays are known for its durability, issues and problems may occur over time. So, while it is working, it is essential to conduct proper maintenance such as cleaning the screen or calibration. However, in case the device malfunctions and could not be easily fixed, it is best to consult with the manufacturer’s technical support team. 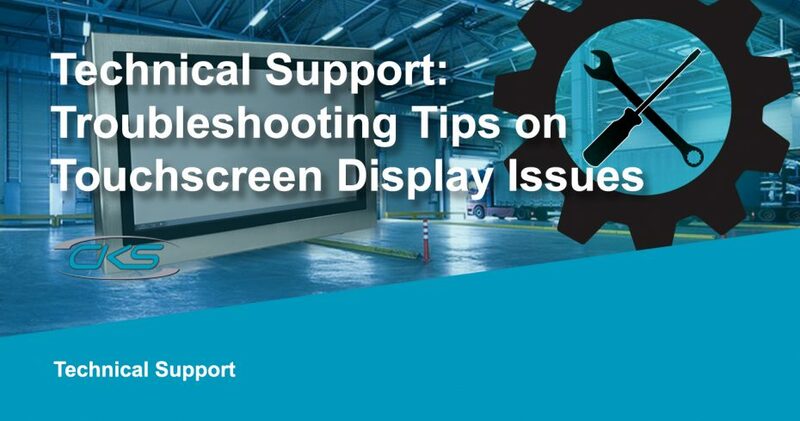 For industrial applications, find a reliable industrial computer provider to learn more about troubleshooting and care tips for touch panel displays today.